Four Female Acrobats (1934 / via Rachele Ceccarelli) perform in full costume for Robert Douglas Lockhart, a Professor of Anatomy from the University of Birmingham, and A.C. Fowler, a radiographer from the University of Aberdeen. The female body appears in live motion, slow motion, and skeletal/radiographic stills. Linda Williams’ reading of science and bodily spectacle (“pornographic answers proceed from academic questions”) seems like a critical starting point in understanding the confusion of visual/disciplinary registers, the fetish objects that accompany these bodies, and the shift from fleshy (flashy) surfaces to bony interiors. It is likewise worth noting that these images arrive forty years after Muybridge: Williams’ own starting point in her study of machines of the visible and visual frenzies. A new film collection has just been introduced. It stretches from 1897-1944. It is the product of 11 years of labor; preservation support from Giornate del Cinema Muto and the L. Jeffrey Selznick School of Film Preservation at George Eastman House; and a collaboration between Paolo Cherchi Usai and Joshua Yumibe. This database is a record of the 35mm nitrate film frame clippings collected by Italian film historian Davide Turconi (1911-2005) from the Josef Joye Collection in Switzerland and from other unidentified sources. The collection consists of 23,491 clippings in total (usually two to three frames each). The vast majority of the frames cover the early years of cinema (from ca. 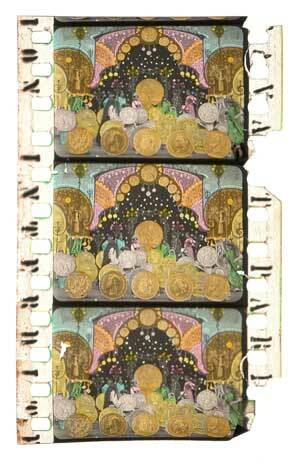 1897 to 1915); however, some items in the collection represent films produced as late as 1944. Another history here. The complete clip/fragment collection can be viewed here. The Turconi Collection (a name that displaces/conceals the layers of collecting/archiving at work) raises a number of important questions for early film historians: what is the value of the (literal) film fragment? What history can we tell with a frame or two, multiplied by 23,491? What kind of (imaginary, phantom) history does it allow us to write, encouraged perhaps by the dazzling colors of the collection? The archive sends us down a rabbit hole of historical and archival exchanges: from Cherchi Usai to Turconi to Joye to the anonymous others in-between. It also sends us to the mirror as we self-reflexively consider the (seemingly limitless) boundaries of the contemporary digital archive. In honouring “Turconi’s belief that knowledge is a treasure to be shared,” perhaps we can also ask: what kind of knowledge is constituted here? And what is its relationship to the visual treasure? Correction: A previous version of this post referred to the Turconi Collection as the “Turconi Archive.” Nowhere in the project’s description/site materials is this term actually used. Robert Koch makes Gunning’s case, joining proto/early cinemas to the avant garde. New sound and color from Andy Kwietniewski for La Maison Lumière. At the 2010 Cinema Ritrovato festival in Bologna, Thierry Fremaux (the director of the Institut Lumière) lectured alongside eighty Lumière films, many of which were newly restored and never-before-screened. Among them, an updated Sortie d’usine from 1995 “to celebrate the centennial of cinema’s birth.” This renovation featured a hundred or so of the “world’s most important directors” streaming out of the factory’s gates in Lyon. Only a handful of women could be counted among the crowd. Kwietniewski’s remix importantly draws attention to the gender of the original workers: the hundreds of women in the early film factory. Just a few years later, they would be the ones doing all the coloring by hand, one frame at a time.